2019 has started with a bang as we end another fantastic month! Olympic medallist, Katerine Savard had a jam packed room locked in on her as she shared her story, en Français, in Gatineau, Quebec this past January. Many incredible athletes shared stories of hardship, perseverance and grit. We hope you got a chance to get involved to help #endthestigma around mental illness. If you have a story about a young person who you feel has benefitted from Head to Head mentorship, please let us know! We would love to do a feature! We received an incredibly kind donation from FEI Canada at their mental health awareness event on Jan 30th, and we would like to thank them for their tremendous generosity. Below: Our Founder, Martha, hit social media to spread awareness and lend a helping hand to anyone who may be suffering in silence. Resilience can be defined broadly as the ability to bounce back from adversity. Research has shown that in order to prevent the onset of mental health issues, it is essential to not only target risk factors but also to increase adoption of protective factors, like resilience! Along with collecting feedback from current programs, we're also studying health and wellness, and specifically the different tools that we can build out to effectively provide young people with the soft skills they require to excel their own lives. We have two requests for you! 1. Do you have 20-30 minutes for an informational phone call with us? Are you, or somebody you know, a coach, parent, teacher, principal, guardian or somebody who is passionate about youth wellness and can set aside time for a phone call to talk about your thoughts and experiences as they relate to youth health? 2. Do you know of any schools, clubs or organizations that might be interested in chatting about Head to Head mentorship programs for 2019 and beyond? There is still time for clubs and schools to register for the remainder of 2019, and we have some fantastic Olympian mentors who are trained, primed and ready to hop on as a mentor for the next 5-6 months! Head to Head on the News!! Please share these links and details! In pool focus: Underwater work off the walls, sculling, breaststroke pullouts, kick and more! In classroom focus: Healthy Habits; sleep, nutrition etc. In classroom focus: Managing Nerves and more! In classroom focus: Team culture, daily training environment, and more! We are in the process of building out and renewing partnership for 2019! So far all partners are staying on board for more strategic brand activations and general support for our mission! As many of you know, Head to Head hosts two different 3 day summer clinic series in the summer. One in Ottawa and one in Toronto in July and August (details to follow in coming months – stay tuned). 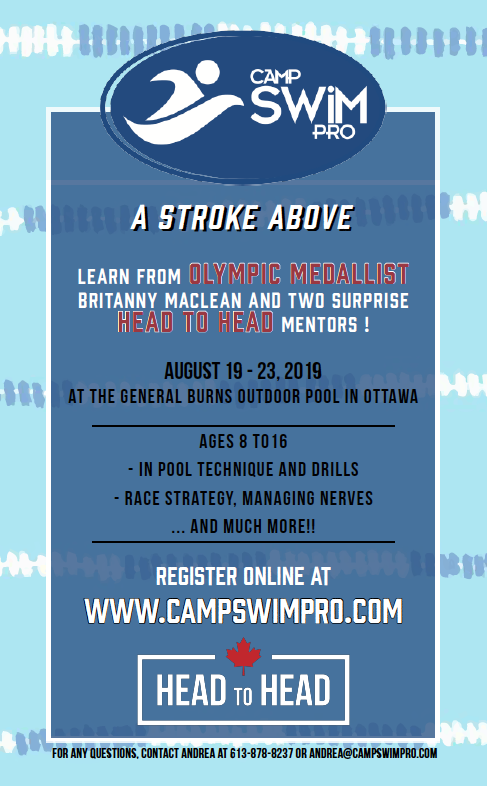 In addition to our very own clinic series, we have partnered with Ottawa’s Camp Swim Pro, to provide more opportunities for the swim community to connect with our fantastic Head to Head mentors!! Camp Swim Pro will be running a 1 week swim camp in Ottawa from August 19 – 23 and this year Olympic medalist, Brittany MacLean, as well as 2 other surprise Head to Head mentors will be guest coaches, speakers and leaders throughout the camp. This clinic is hosted by Camp Swim Pro, so please visit www.campswimpro.com to register and contact Camp Swim Pro director, Andrea at andrea@campswimpro.com if you have any questions!